Amy Merritt was born in Sonora, Texas. She received a Bachelor of Arts in Psychology from University of Texas at Dallas, in 2002. In 2007, she completed a Bachelor of Science in Nursing program from Texas Woman’s University. Following graduation, she worked as a Registered Nurse in the Cardiovascular Intensive Care Unit at Baylor University Medical Center, Dallas and at Baylor Heart and Vascular Hospital, Dallas for six years combined. 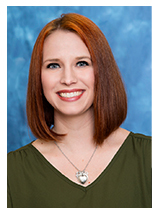 In 2012, Amy graduated from Texas Woman’s University earning her Master of Science as a Family Nurse Practitioner. Amy has been a Family Nurse Practitioner since 2012. She has experience working in Pulmonology and Nephrology. She is board certified through the American Academy of Nurse Practitioners and licensed by the State of Texas with prescriptive authority. She is licensed to diagnose, examine, and treat patients under the direction of Drs. Scott Biedermann, Jessie George, Samitha Reddy, John Hartono, and Alice Hsu. Amy co-authored a published article on The Impact of a Low Glycemic Diet and Exercise on Hemoglobin A1C, titled: Tale of a Compliant Patient, published in Clinician Reviews 04/2012, February 2013, Volume 23, No.2. Amy currently works with our dialysis patients around the metroplex and in the clinic seeing new patients as well as established patients. Amy has lived in Texas most of her life and resides in Murphy. She is married, with a son and daughter. She is actively involved in her church, Watermark Community Church Plano. She loves biking, attending local sporting events, target practice, traveling, and spending time with her family.